The Kunsthal is always actively on the lookout for engaged funds, enthusiastic private individuals and active businesses whose donations make it possible to bring what seem to be unattainable exhibitions and top artists to Rotterdam. Many donors, funds and sponsors generously supported the various projects of the Kunsthal in 2015 as well. We are very grateful to them for their financial support, which has enabled the Kunsthal to present its ambitious programme. For a survey please go to The strength of collaboration, where all of our 2015 partners are listed. The supporters programme of the Kunsthal consists of the Friends of the Kunsthal and the Kunsthal Circle for engaged private individuals. For engaged businesses who would like to be involved with the Kunsthal there are the Kunsthal Business Circle and the Kunsthal Ambassadorship. The Kunsthal regards itself as a cultural entrepreneur. Businesses from Rotterdam and the rest of the Netherlands like to associate with the Kunsthal. In 2015 too, many funds and sponsors generously supported the various projects of the Kunsthal. Besides the Kunsthal Business Circle, small and medium-sized entrepreneurs who take art to heart, there are namely the Kunsthal Ambassadors who make a real difference. This is not only because of the higher contribution for a number of years, but also because there are more often points of contact or shared ambitions. A good example is Nationale-Nederlanden, with whom the Kunsthal has shown talented artists in the past two years in the Kunsthal Light programme. In 2015 the Kunsthal and Nationale-Nederlanden jointly gave JINC job application training to pupils in Rotterdam intermediate professional education. This was the first introduction to the work of Keith Haring for those taking part. Thanks to the close collaboration with sponsors, an extra impulse has been given to the visibility of the Kunsthal. A fine example of this is the collaboration with Schmidt Zeevis, which not only provided fresh herring for the opening of the Keith Haring exhibition and during the Keith Haring Weekend, but also put advertising for the Kunsthal on 54 transport vehicles. 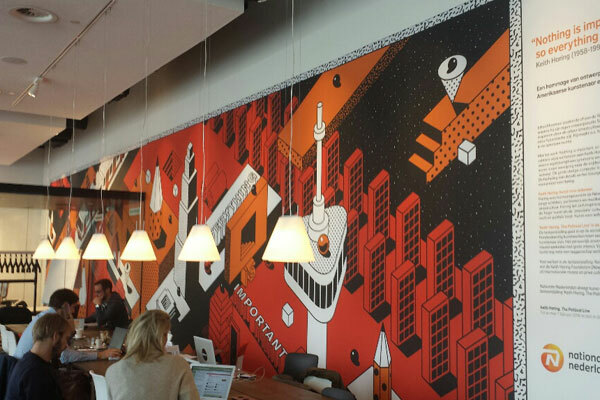 The loyal ambassadorship of Nationale-Nederlanden has led to the decoration of the interior of the busy NN DE Café next to Rotterdam Central Station once a year in close collaboration between the Art & Design department of Nationale-Nederlanden and the Kunsthal. For the full duration of the Keith Haring exhibition, the NN DE Café showed a tribute to Keith Haring by the artist Johan Moorman under the title ‘Nothing is important, so everything is important’. 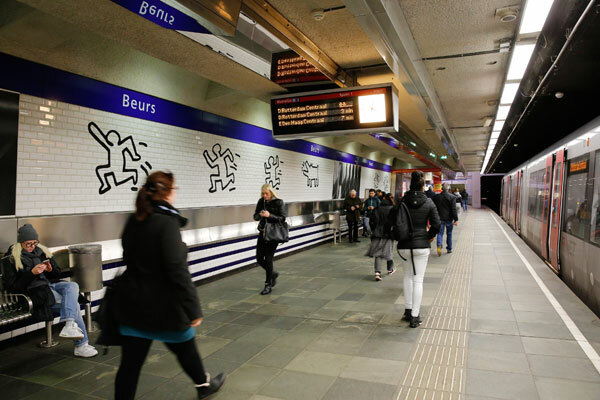 RET made the Beurs metro station available free of charge for a striking City Dressing Campaign for the Keith Haring exhibition – supported by Rotterdam Festivals and a collaboration with Bijenkorf Rotterdam and dozens of entrepreneurs in the Nieuwe Binnenweg. Ambassador MediaCenter Rotterdam provided the splendid printed matter and the big prints in the same exhibition. The Kunsthal and ING organised the first Kunstbuzz for more than 300 school pupils from the Rotterdam region in 2015. Every year the Kunsthal and ING will organise the Kunstbuzz to transport more than 1,000 school pupils. Pupils from schools in the Rotterdam region are picked up from school in the bus and are taken with accompanying adults to visit exhibitions in the Kunsthal. The first ING Kunstbuzz took them to see the exhibition ‘Keith Haring. The Political Line’. The major supporter of the Kunsthal is the BankGiro Loterij, the number one culture lottery in the Netherlands. 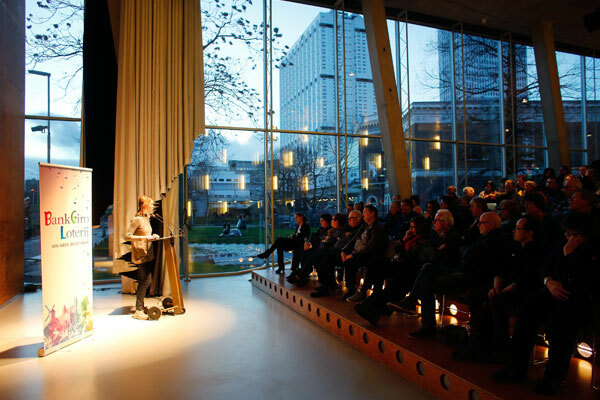 In 2015 the Kunsthal received the annual contribution of € 200,000 from the BankGiro Loterij. In 2011 the BankGiro Loterij stated its intention to extend the annual contribution for five years. 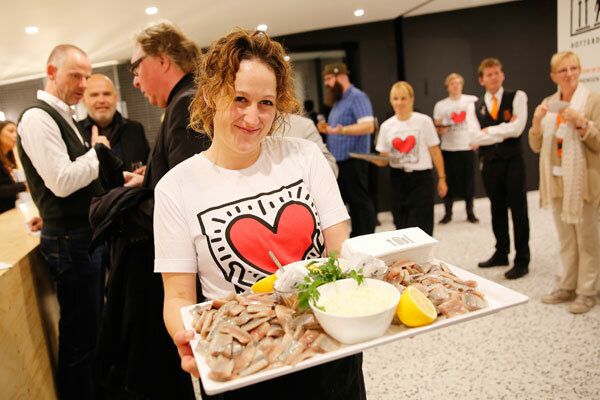 In addition, the BankGiro Loterij made a substantial contribution in the form of purchasing tickets for the Keith Haring exhibition and a special VIP reception for participants was organised. In collaboration with the BankGiro Loterij, in 2013 the Kunsthal was launched as a pilot to recruit ‘earmarked lottery tickets’. 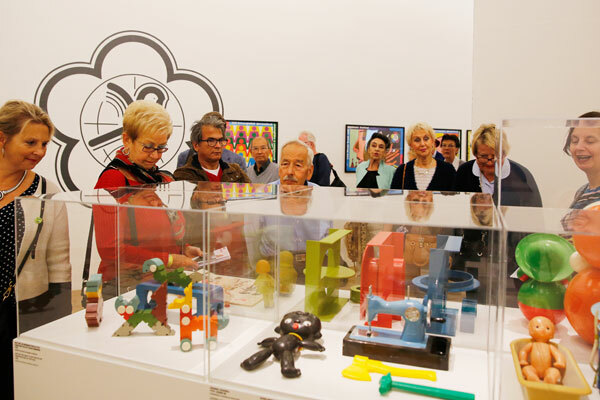 Visitors could take part in the lottery specially ‘for the Kunsthal’. In 2015 their lottery tickets supported the Kunsthal with a total of € 108,256. The Kunsthal holds fifteenth place in the country for the sale of earmarked lottery tickets, preceded by such institutions as the Rijksmuseum and the Netherlands Open Air Museum. Members of the Kunsthal Business Circle contribute each year to the (advance) funding of major exhibitions, or contribute in kind or as barter. In return they are allowed to use the Kunsthal as a network location and for their loyalty programme (membership is the current year in euros: € 2015). Many a Business Circle member organised an event in the Kunsthal in 2015. At the request of our members, the Kunsthal organised special guided tours and presentations, network breakfasts, swinging receptions and chic dinners for their employees and business relations. Attractive arrangements were put together, goodie bags were handed out, and special offers were made. 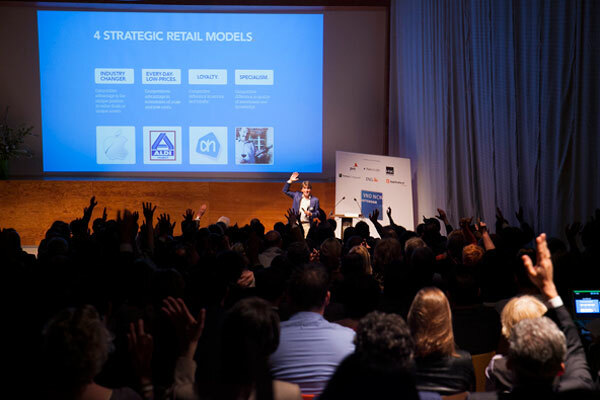 On 15 April the Kunsthal organised for the sixth year in collaboration with VNO-NCW Rotterdam a meeting for the Kunsthal Business circle with small and medium-sized enterprises, ‘The art of simply doing’, with guest speaker Pieter Zwart, director and founder of Coolblue. The Kunsthal set up the Kunsthal Consuls, an advisory group of people from the Rotterdam business world with an extensive network. They include Ellen Meijer (Rabobank) and Melany van Twuijver (EDBR). Their main task is to enlarge the basis of support for the Kunsthal and to introduce the directors to possible partners in the business world. In addition, the Kunsthal is working on the Ambassadors Network of regular sponsors, who can help the Kunsthal as very valuable substantive and financial collaboration partners. In 2015 they were the ROC Albeda College, Nationale-Nederlanden, Sundio Group, MediaCenter Rotterdam, solicitors’ practice Kneppelhout & Korthals and Delta Lloyd.